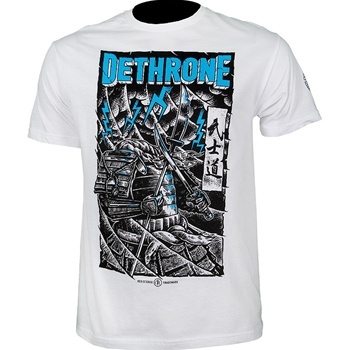 Check out the Dethrone Jose Aldo UFC 129 Walkout T-Shirt! The legendary UFC featherweight champion Jose Aldo went to war in UFC 129 in nothing other than the Dethrone Jose Aldo UFC 129 Walkout T-Shirt. His performance wasn’t the best, but it was pretty damn stellar considering the fact that he had the flu during the fight and was even asking for antibiotics in-between rounds. What a gangster. You too can be a gangster like Jose Aldo with the Dethrone Jose Aldo UFC 129 Walkout T-Shirt. Now available at MMAWarehouse for $27.99.